It's 9pm PST, 1 1/2 days into Terry Hershner's trip in which he's attempting to set a record for cross country electric motorcycle travel. The Facebook post embedded below was posted 5 hrs ago, from El Paso, his last status update a few minutes ago shows him now on the highway a few miles east of El Paso. What Terry wrote on Facebook, "We're gonna try to be friends this time," is deserving of some explanation because Terry has some history with West Texas. 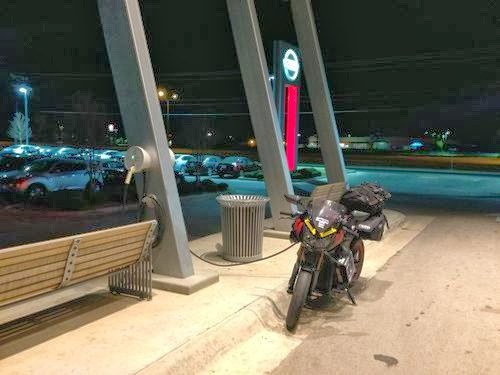 Over the last year he's made several cross country trips with his electric motorcycle. It started with a long distance trip in early 2012 going from Florida to Tennessee for a conference. Since then he's made trip after trip, continuously improving his bike and techniques. In December 2012, 11 months ago, Terry set off on his first cross-country trip. The goal was to arrive in Los Angeles for the unveiling party of Zero Motorcycles' 2013 model line. He set off from Florida and I was following his Facebook updates with interest. But.. then... there was this abrupt jump from West Texas to Los Angeles, and immediately before-hand Jeremiah Johnson had made a couple Facebook posts about driving his van through the night. What I learned later is that West Texas was an insurmountable hurdle for Terry, at that time. But now, Terry has the machine which can conquer West Texas. Terry had counted on a public charging station owned by Oncor Electric in Big Springs Texas, that's shown on the ChargePoint maps. But, the charging station turned out to be closed to the public. While he was able to locate a big truck repair shop that let him use power outlets normally used by welding equipment, the long distances in the desert south-west were too much of a risk. At that time he followed a pattern of riding 45 miles, then charging enough for the next 45 miles. The south-west is so vast that charging opportunities are more than 45 miles apart. Zero Motorcycles really wanted him and his bike in Los Angeles for the event, leading to Jeremiah driving to pick him up and together they went to Los Angeles for the event. In other words, his first cross country attempt didn't achieve the goal of making it all the way across the country. But, that didn't stop him. Instead of returning to his home in Florida, Terry stayed in California, shuttling between the Los Angeles area and an apartment he rented in the Santa Cruz area. Terry found collaborators in both areas and set about redesigning his bike for longer riding range and more energy efficient. Rather than a 45ish mile range per charge, the bike now has nearly 200 miles range per charge. As I wrote the other day, a key connection he made was to meet Craig Vetter. Craig has been working on fairing designs for decades, and especially has focused on ideas he gathered while following Buckminster Fuller around - doing more with less. Craig applied those ideas to Motorcycle Design with properly aerodynamic fairings so motorcycles would perform better, while using less energy. 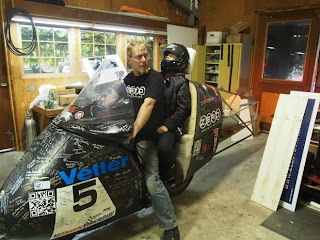 For the last few years Craig has worked on the "Last Vetter Fairing" project. The goal of this project is motorcycles that serve daily transportation needs while being extremely fuel efficient. Over 100 miles/gallon fuel efficiency, while being able to carry 4 bags of groceries. What's on Terry's bike is a version of that Fairing. With it, his bike has well over 100 miles/gallon equivalent fuel efficiency, and can carry way more than 4 bags of groceries. Or, in the case of this trip, tools and power adapters and cabling. With that fairing, Terry has already ridden from California to Florida, then from Florida to the Canadian border north of Seattle, then from there to the Mexican border south of San Diego, then attempted to ride from California to Ohio, and in-between he's made several trips up and down California. Just before this trip his bike hit the 50,000 miles mark, thanks to these trips.